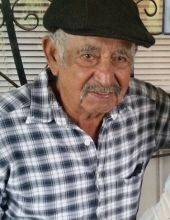 Domingo Tobar born February 12, 1939 passed from this life on February 6, 2019 at the age of 79 years. He was preceded in death by his parents, Lino and Josephine Tobar; and his brother, Johnny Salinas. Domingo is survived by his loving wife, Antonette Salas Mendoza; sons and daughters-in-law, Domingo Tobar Jr. (Mary Helen), Chris Tobar (Vanessa), Lino Tobar (Trina), Antony Mendoza (Mary Ann), Gregorio Mendoza, and Mike Mendoza; daughters and sons-in-law, Gilda Mendoza, Esmeralda Pena (Lupe), Marie Mendoza, Michelle Martinez (Manuel); brothers and sisters, Cristobal, Lino, Lupe, Martin, Veva, Sara, Andrea, Luisa, and Lupita; numerous grandchildren; other relatives and dear friends. He will be missed but never forgotten. To send flowers or a remembrance gift to the family of Domingo Casarez Tobar, please visit our Tribute Store. "Email Address" would like to share the life celebration of Domingo Casarez Tobar. Click on the "link" to go to share a favorite memory or leave a condolence message for the family.